Wavemakers Synthesizers Modules. The 652 Dual Voice Subsystem consists of two VCOs, two VCFs, two VCAs, an FM generator (LFO), and two contour generators. Routing of control signals and output signals is done through selector switches. Each of the two VCOs put out two waveforms simultaneously. These can be modulated so that an input voltage can change the waveshape - sweeping it between the waveforms mentioned. 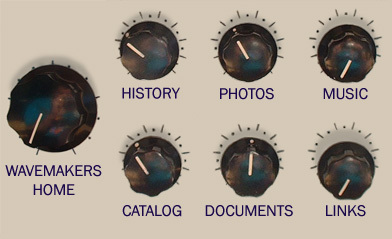 A white noise source is also available as a component of the oscillator's output. Octave switches and vernier pots are provided for adjusting the tuning and range of the oscillators. A quad lap generator converts a single control voltage into a series of overlapping contours by causing each instantaneous voltage level to define four discrete gain/phase relationships. The FM generator puts out three selectable output waveforms (sine, triangle, and square). The output level of the FM generator can be controlled by contour generator A so that the depth of modulation varies with time. Frequency range of the FM generator is from.05 Hz to 2 kHz, and can be expanded through use of control voltages. The VCFs are triple-mode, state-variable filters so that lowpass, highpass, and bandpass outputs are available singly or in combination with each other. The basic attentuation slope is 12 dB/octave. The 653 keyboard controller is a 44-note keyboard that can put out two simultaneous and independent control voltages and triggers. If the upper note is released while the lower note is still being held down, the lower voice can be changed without affecting the upper voice. Momentary switches are provided on the keyboard controller to shift the control voltage up or down from the keyboard. The 654 control array includes two dual delay envelope generators (DADSRs), an 8-step analog sequencer, a joystick controller, and a random voltage source with a delayed clock generator. Price for the modules as an entire system is $2,250.00. Wavemakers, Box 27, Edmonds, WA 98020.